"iPhone 6 isn’t simply bigger — it’s better in every way. Larger, yet dramatically thinner. More powerful, but remarkably power efficient. With a smooth metal surface that seamlessly meets the new Retina HD display. It’s one continuous form where hardware and software function in perfect unison, creating a new generation of iPhone that’s better by any measure." The size of the new, higher-resolution Retina HD displays on iPhone 6 may be the first thing you notice. With innovations that deliver higher contrast, dual-domain pixels for more accurate color at wider viewing angles, and an improved polarizer, these are the thinnest, most advanced Multi-Touch displays Apple ever made. And it enables you enjoy iTunes purchased or rented movies better than ever with the new iPhone 6. Then, let's explore how to transfer iTunes videos from iTunes to iPhone 6 and how to keep iTunes rentals forever on iPhone 6. Tutorial - How to transfer purchased or rented movies from iTunes to iPhone 6? 1 Plug the dock connector end of your iPhone 6 USB sync cable into your iPhone 6 and the other end into an available USB port on your computer. 2 Open iTunes if it does not start automatically. 3 Locate and click on the iPhone icon under the "Devices" list in the left window pane of your iTunes window. 4 Select the "Movies" tab from the top of the iPhone 6 "Settings" window. 5 Click on the "Sync Movies" check box. By clicking on the "Automatically include all movies" check box, all movies are synced to your device. Clicking on the double arrows reveals more sync options. If you want to select what movies you want to sync, leave the "Automatically include all movies" box unchecked, and check the box of each movie you want to sync in the "Movies" window pane. 6 Click on "Sync" located in the bottom-right corner of your iTunes window to begin the transfer process to your iPhone 6. How to enjoy iTunes movies on Android devices or TV? Keep rentals forever on iPhone 6? 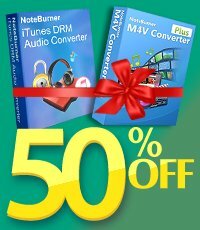 NoteBurner M4V Converter Plus is a professional DRM removal and iTunes movie converter which can help you remove DRM protection and convert iTunes movies and TV shows losslessly to Android devices or TV supported MP4 format so that your Android devices or TV can work with movies or television shows purchased or rented from the iTunes Store. Besides, iTunes rentals are included. Because NoteBurner M4V Converter Plus supports to convert rented movies or TV shows as well! It means that you can keep your iTunes rentals forever like purchased movies! Step 1: Launch NoteBurner M4V Converter Plus after you install it. Click "Add Movies" button on the upper left of the interface to add iTunes purchased or rented movies you need to convert. The left picture below illustrates Windows verison while the right one illustrates Mac version. Step 2: Click the selection button next to "Convert to" and choose "Customized MP4" format to change the parameters according to your preference. The DRM M4V Converter provides flexible options to customize output video. You can change the video codec, bitrate, size and even remove the scenes you do not need to preserve. Also, if you set output format as "Same as source for mp4/mov", you can convert the iTunes videos with 5.1 audio track and all subtitles preserved. Step 3: Click "Convert" button to start removing the DRM protection and converting iTunes movies to normal MP4 video file. Once it finishes conversion, you can open the output folder to find the converted video file. Now you can transfer the converted iTunes movies to any Andorid Devices or TV for watching. If it is iTunes Movies Rentals, you can keep it forever on your iPhone 6 or your PC as you want!